Audioengine goes passive with P4 speakers | What Hi-Fi? The AP4 is designed as a high-performance bookshelf speaker with the same looks and sound as its powered brethren. Audioengine says it's designed to work as part of a hi-fi system in your living room, bedroom or office or with other Audioengine speakers in a home cinema system. "The goal was to design a small but powerful bookshelf speaker for people who already have receivers or amps and are looking for the same Audioengine sound and quality in a passive loudspeaker," says Audioengine's co-founder Dave Evans. "The AP4s work great with Class D desktop amplifiers, stereo receivers and tube amplifiers." 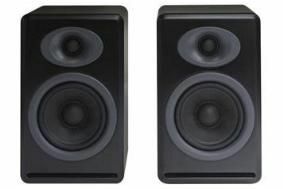 They're a two-way passive, front-ported design with 20mm silk-dome tweeters and 10cm Kevlar woofers. They can be wall, shelf or stand mounted, are magnetically shielded and have five-way, gold-plated binding posts. Recommended amplifier power is 10-125W per channel, nominal impedance is 4-8 Ohms and sensitivity is 88dB/w/m. They're available in satin black or gloss white for £175, or bamboo for £230. You'll be able to buy them online shortly at Ecodigital.